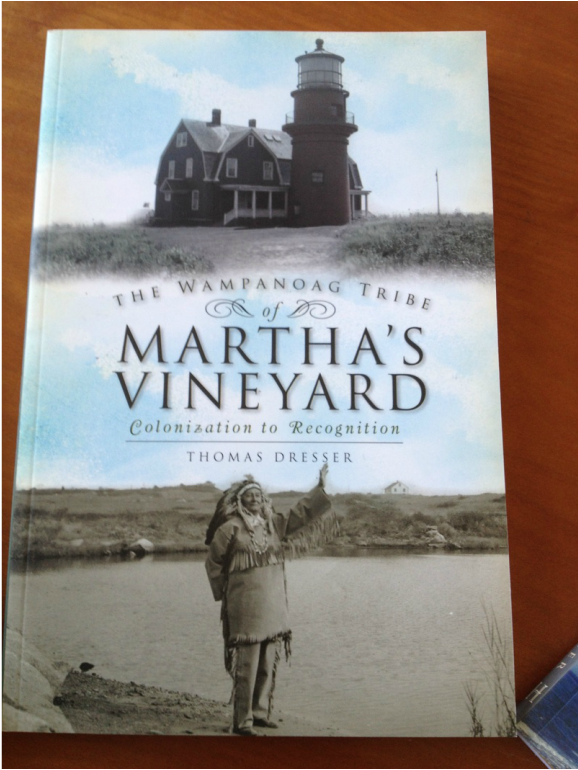 The Wampanoag Tribe of Martha's Vineyard was carefully edited by Linda Coombs, a member of the Tribe. Working with Linda gave me a better understanding of the Wampanoag people, and their cultural suffocation when the white man "discovered America." The story of the Wampanoag is the story re-enacted by Native Americans across America, except on the Vineyard it was the bible, rather than the bullet, which subdued them. Click here to purchase "The Wampanoag Tribe of Martha's Vineyard"
Great photos entice the reader. Top is the old Gay Head lighthouse keeper's cottage; bottom is Chief Harrison Vanderhoop by Menemsha Pond. The story of the Wampanoag is the saga of Native Americans who survived on Martha's Vineyard for ten thousand years. Read about the archeological research of early Vineyard natives. Consider the elements of the white man's arrival, and how the Native American population had no choice but be absorbed into the white man's society. Consider the detriment to the cultural history of the Wampanoags, subjected to the intrusion of the white man. This story resonates with a cultural threat from the white man, but the Tribe is still surviving and thriving to this day.